Carrying a high credit card balance, even on just one credit card, can be detrimental to your credit and your finances. The amount of debt you're using is second biggest factor impacting your credit score. Because debt amounts are so important for your credit score, having high credit card balances can have a negative impact on your credit score. Not only are high balances bad for your credit score, they're also bad for your wallet. Higher credit card balances are subject to higher finance charges — money that goes to the credit card issuer for extending you the convenience of repaying your balance over time. And if your balance has a high interest rate, those monthly finance charges makes it more difficult to repay your balance. High credit card balances can stand in the way of you getting approved for other credit cards and loans. Credit card issuers and lenders prefer that your credit card balances are low. If you're approved, even with a high credit card balance, you may be approved at a higher interest rate that if you had a lower balance. Paying off high credit card balances is beneficial for many reasons, but knowing just how to tackle these high balances isn't always easy. Here are three strategies you can use. Trying to use your credit card and pay it off at the same time is the credit card equivalent of wanting to keep your cake and eat it too. It's simply impossible to do both. If you want to pay off your credit card balance, you have to stop using your credit card completely. Otherwise, you only perpetuate a never-ending cycle of debt. Imagine, for example, you have $1,000 credit card balance with a 15.9% APR. Your monthly finance charge would be $10.89, making your balance $1010.89. After a $100 payment, your balance would only drop to about $910. If you later use your credit card for a say, a $125 purchase, your balance rises to $1035. After another finance charge and $100 payment, your balance would be $946. From a mathematic standpoint, you'll eventually pay off your credit card balance as long as your total monthly purchases (plus fees and interest) are smaller than your monthly payment. Even then, it will still take longer to pay off your balance than if you just stopped using your credit cards. In the previous example, you could pay off the $1,000 balance in just 11 months with $100 monthly payments and no purchases or additional fees. Avoid relying on your credit cards for any purchases. That means keeping your spending below your income so you're not forced to use your credit card to make ends meet. This may mean closing your credit card so you won't be tempted to use it. Closing a credit card with a balance can affect your credit score in the short-term, over time, reducing your credit card balance is better for your credit. Your credit score will rebound as you pay off your balance. If you don't want to close your card, but still want to keep it off limits, consider going the ld-fashioned route and cut it up. Get rid of the pieces and you won't even be able to use your credit card for online purchases. Remove your credit card from any one-click billing services and set recurring subscriptions to your debit card or checking account. Avoid having fees like late fees and return payment fees added to your account also helps you pay off your balance faster. You may not be able to avoid an annual fee, but you may be able to transfer the balance to a credit card that doesn't charge the fee. Your interest rate plays a major role in paying off your credit card balance. That's because a portion of each of your monthly payments will go toward interest in the form of a finance charge. The higher your interest rate, the higher you monthly finance charges and the more of your monthly payment that will be applied to interest. You can completely eliminate interest as a factor in paying off your credit card balance by transferring your balance to a credit card with a 0% interest rate. Most major credit card issuers offer at least one 0% balance transfer credit card. When you qualify and move your balance to the credit card, you'll enjoy at least six months of interest-free payments, possibly more depending on the credit card you qualify for. You can use this interest-free time to knock out a large portion of your credit card debt. If you have several credit cards with high balances, move the balance with the highest interest rate for the best opportunity for savings. Your 0% APR won't last forever. Take advantage of a balance transfer by paying off as much of your balance as you can while the promotional period is in effect. Avoid making new purchases on your credit card, even if the card extends the promotional rate to purchases, too. Credit card issuers make you feel comfortable with making just the minimum payment. 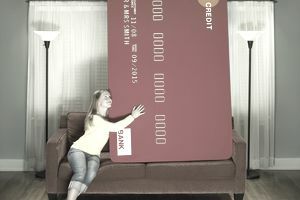 It's all you need to pay to keep your credit card in good standing. You'll avoid late fees and your account will be reported as current to the credit bureaus. Making minimum payments, however, is the worst way to pay off your balance. When you pay only the minimum, it will take the longest amount of time and cost the most interest. For example, it will take you more than 13 years to pay off a $1,000 balance with a 15.9% interest rate pay just the minimum each month, even if you never make any additional charges on the credit card. Why does the minimum payment take so long? For one, a large portion of the minimum payment goes toward paying the interest on the account. Because of that, your balance only goes down by a small amount. Second, because the minimum payment amount is calculated as a percentage of your balance, your payment goes down as your balance goes down. It gets easier to make the minimum payment, but still, only a small amount of your payment actually goes toward paying the account balance. Tackling a high credit card balance requires that you consistently make bigger payments toward your balance. Consider the $1,000 balance mentioned before. If you make $50 monthly payments toward the balance each month you'll pay off the balance in just two years. That's 11 years faster than if you paid just the minimum. You'll also save hundreds of dollars in interest. Want to know how long it will take to pay off your balance if you only pay the minimum? Check the most recent copy of your credit card billing statement. Credit card issuers are required to let you know the amount of time and total amount you'll pay if you only make the minimum payment. Your statement will also include the amount you'll have to pay each month to pay off your balance in three years. Tackling high credit card balances isn't easy, but if you're diligent and consistent about paying more than the minimum will allow you to pay off your credit card balance for good. Once you've paid off your balance, make a habit of paying your credit card balance in full each month and you'll avoid getting stuck with another unaffordably high credit card balance.